The new head teacher of a failing Norfolk school has defended introducing a new stricter regime. Barry Smith from the Great Yarmouth Charter Academy was criticised by parents after bringing in new strict rules to improve performance. 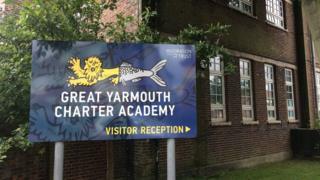 Children at Great Yarmouth Charter Academy were told to be in bed by 21:30 BST and mobile phones could be confiscated for six weeks. Mr Smith said he aimed to boost exam results for pupils. The school was taken over by the Inspiration Trust after it achieved some of the worst GCSE results in the county. Mr Smith met with parents of pupils at the school at a meeting. Before the meeting, he told the BBC parents would see the difference his new rules would make. "Their kids are not going to be bullied... or spat at," said Mr Smith. "They are going to leave achieving really good exam results. "Are exams everything? No. But they keep doors open. And exam results have been through the floor [at this school]." Concerns about the way the rules may affect children with autism have been raised. The school's 22-page rules guide tells pupils to "make confident eye contact". The National Autistic Society has asked the school not to apply the rule to autistic students, like 12-year-old pupil Reese O'Rourke. Reese's mother, Charlene O'Rourke, said her son struggled with making eye contact with people and she would not want him to be forced to do so. She said: "They [pupils] do need to have discipline, but can't discipline a child with special needs because that is not going to work. It will make my son retaliate." Jane Harris, director of external affairs at the National Autistic Society, said the rule could be "discriminatory and potentially be breaking the law" because keeping eye contact can be "physically painful" for some autistic people. Mr Smith defended the school's behaviour rules, and said: "We take support for children with special education needs very seriously, and one of the reasons for our strict approach on behaviour is to ensure we have calm classrooms that allow as many pupils as possible to take part in mainstream lessons with their peers. "Even in these first few days we have children thriving in classes who previously couldn't cope with the noise and behaviour they faced."